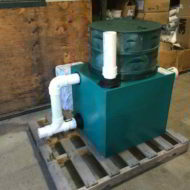 For flood dosed or pressure septic fields. Exposes entire field to effluent. Increases efficiency and life of field. Less cost and more reliable than siphon systems. Dose can be factory pre-set. No standby volume required for dosing tank. 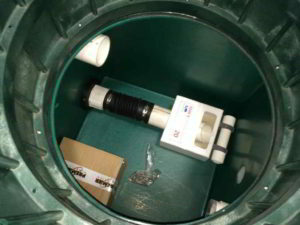 Flout Floats up with rising effluent in tank. At maximum rise, effluent spills into Flout. Flout loses buoyancy and sinks back. Effluent discharges through the Flout until level reaches top of Flout. Effluent in Flout and discharge pipe then drains out. Flout re-floats to restart the cycle.